This bird law regulates the peaceful coexistance of the flock. The number 1 bird in the flock can peck and dominate all the others, the number 2 bird can dominate all but the number 1 bird, the number 3 bird can dominate all but # 1 and # 2, right on down the line until we reach the last bird who dominates no one. Introducing a new bird into a flock threatens the existing pecking order. This normally results in a power struggle for position. Unless the conflick is causing serious injury to the participants, do not intervene, remeber that the law of pecking and roughhousing is for the future peace of the flock. Ducks forage for their food. Their chow consists of 90% vegetable. This can be seeds, berries, fruits, nuts, bulbs, roots and grasses. The other 10% is animal matter such as insects, mosquito larvae, snails, slugs, leeches, worms an occasional fish or tadpole. Sand and gravel are picked up to serve as grinding stones in the gizzard. Ducks dabble and tip up in shallow water, drilling in mud to get the goodies. I call it making mud pies. There are additonal feeding requirements if your duck does not have these natural goodies to forage for. You can find them in the care section of these pages. Water fowl are skillful swimmers from the day they hatch and will spend many happy hours each day bathing and frolicking on the water if it is available. Ducks can be raised without swimming water as long as they have drinking water deep enough to get the bill and eyes in the wate to clean the face. Domesticated drakes may have a favorite but, normally will mate with any hen in the flock. If you have more than one breed and wish to hatch purebreed offspring, each variety should be separated three weeks prior to and during the breeding sason. One drake may be given for two to five hens. For good furtility, hens need to be bred at least once every four to five days. A few eggs which are laid as long as two weeks after may hatch. Ducks prefer to mate on water, but most do well on land. Fertilty will be higher if there is access to swimming water at least 8 inches deep. Bobbing head up and down- This seems to say ...hey your cute, how's about a date ? Drake biting and/or pulling the back of the hens neck/feathers. Drake standing on hens back dunking the hens head in the water. This looks like he's trying to drowned her. 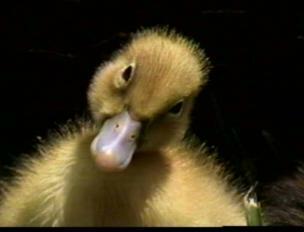 Domestic ducks often lay eggs at random on the ground, and sometimes even while swimmng. When a nest is made, it is a shallow depression in the ground, lined with twigs, grass and leaves. If eggs are left for natural incubation, the hen will pluck down from her breast for additioal insulation. If the ducks have a house with staw, hay or some type of bedding in it they may make their nest there. You can make a next box for them out of items you may have at home. Dimentions should be about 12" X 12" X 6" high, lined with straw. Ducks can live a long time if not used for Christmas diner and are protected from or accidental death. They may live and reproduce for six to eight years. Few birds die of old age, since fertility decreases after 1 or 2 years , egg production declines after 3 or 4, most owners turn em in for new models past this age. NOTE: If you can adjust the volume of the sounds, turn the sound down to a whisper for the drake and up for the duck, to hear a truer representation of the quacks.